I tell you, now is the time of God’s favor, now is the day of salvation. I hate waiting. I especially abhor needless and unnecessary waiting. I confess. I’m convinced this particular disdain and impatience is rooted in being the youngest of four. Growing up I spent years watching my older siblings get to do things before I did. In most cases I can look back from a place of maturity and understand requisite age and size restrictions. Still, there were times when I rightfully argued that capability should have outweighed arbitrary age limits for certain activities. I’m sure of it. At least, that’s the whine of my inner child. It never ceases to amaze me just how much our childhoods continue to subconsciously affect us in our adult years. Just this past year Wendy came to a sudden revelation about some inner thoughts she had, and their subsequent emotional reactions they created within. She realized that her thoughts weren’t actually her thoughts, but the voice of her mother playing on an endless loop in her brain. Fascinating. I digress. Back to waiting. As our local gathering of Jesus followers has been journeying through the book of Acts this year I have been reminded of two major paradigm shifts that happened when God moved humanity from the religious legalism of the Judaic system to the outpouring of Holy Spirit in the first century. The second paradigm shift is the lifting of restrictions to experience salvation through Christ and participate fully in the organism Paul refers to as “the body of Christ.” Any and all who choose to follow Jesus have immediate and full spiritual access to all that God has to offer regardless of background, previous record, heredity, socio-economic status, race, gender, politics, education, or age. Any and all who follow Christ receive the indwelling of Holy Spirit, spiritual gifts, and a calling to use those gifts, in love, for Jesus’ good will and purpose. This is a radical, transformative spiritual shift (that human organizations and institutions have continually found ways to reverse for two millennia). In today’s chapter Paul quotes a verse from Isaiah 49. It’s a great messianic prophecy. I get why it would have been one of Paul’s favorite references. All of Paul’s readers who were raised in Judaism would have been raised waiting for the Messiah. It had been 400 years since the last prophet, Malachi, and since then they’d been waiting for what God was going to do. Paul writes to those in Corinth that there is no longer any need to wait for God. All that God has to offer is immediately available to anyone, anywhere, in this very moment. As for following Jesus, Paul writes to the Corinthians, there’s no time like the present moment. I must confess that I am an impatient person. I always have been. Perhaps being the youngest child in a family of four was a contributing factor. You watch all of your sibling growing up and they are always allowed to do cool things while you have to wait. Ugh. I can still feel my childish annoyance with these statements. As I look back on the early years of my journey I can clearly see how impatient I was with the very process of life. I doggedly attempted to push the process whenever I could. I graduated early from high school. I started college early. I was on a mission to find a wife, to get married and get on with life. In retrospect, I can see how often I pursued shortcuts to get further down the road faster. In at least a few cases, the shortcuts had tragic results from which I’ve had to learn some very hard life lessons. As we enter the book of Acts this morning we find Jesus’ followers in a period of waiting. It’s not just the 11 remaining appointed disciples, but also the women who had long traveled with and supported Jesus’ ministry. There is also a larger circle of a hundred or so believers in the entourage including Jesus’ mother and brothers. “What’s next?” is the burning question among the crew. The resurrected Jesus has been making appearances over a six-week period. With their question “Lord, are you at this time going to restore the kingdom to Israel?” the disciples are clearly hanging onto their repeatedly stated desire for a shortcut to what they hope is a restoration of the earthly kingdom of the Jewish monarchy (and their own positions of temporal power and authority within that administration). Jesus first lays down a difficult truth for his followers: You don’t get to know the whole plan. He goes on to explain that the next step is to keep waiting, and to keep praying, for an upcoming event in which the believers will be immersed in Holy Spirit power. Their mission will then be to give witness to ever spreading circles of influence around the globe. This morning I write from a stretch in my personal journey in which I’m experiencing a process of fulfillment in areas of life that I’ve long waited for. I confess that I’m still impatient. Time, experience and maturity has helped, but I still identify with Peter and the crew. I want to know the plan, with dates, and details about what God is going to do in our lives and when He’s going to do it. I have, however, walked this journey long enough to know that this is not how it works. This is a faith journey, and that usually means simply pressing on to the next step. The Lord is not slow in keeping his promise, as some understand slowness. Instead he is patient with you, not wanting anyone to perish, but everyone to come to repentance. In the past few weeks I’ve experienced an inordinate amount of conflict in several different arenas of life. Not necessarily the in-your-face argument type of conflict, thought there’s been a few of those. For the most part it is the annoying, simmering, festering “I’m sick of this sh!t” kind of conflict. I’m not sure what that’s all about. As I sit and ponder in the quiet this morning I’ve concluded that it may simply be the random peaks and valleys of this life journey. Of course, since I’m the common denominator, I must also consider that it may be more about me and less about others. As I think through the various conflicts I realize that in many cases I’ve lost my patience. Unmet expectations, unkept promises, inability to see certain things, and what appears to be a general unwillingness to change brings out in me frustration and then anger. Since I am by temperament a conflict avoider, things tend to get stuffed, then build up. In today’s chapter, Peter reminds the early followers of Jesus of God’s patience. We believers and our institutions have often been guilty of painting God as condemning and quick to judgement. Peter’s description is the opposite. He describes God as patient to the point that people accuse Him of being uncaring or absent. The motivation of God’s patience, Peter declares, is His desire for every single person to wake up, smell the coffee, and make a positive change in life direction. This leads me to look back and revisit my own long periods of wayward wandering. Times when I didn’t live up to expectation, didn’t keep my promises, was blind to see my own issues, and held a fairly steady unwillingness to change. God was patient. Eventually, I found my way (though I’m still in process). I know the golden rule is “do unto others as you would have others do unto you.” This morning I’m reminded of what must be the platinum rule: “Do unto others as God has done unto me.” Jesus said, “As I have loved you, so you should love one another.” That includes patience and an oft forgotten concept: long-suffering. This morning I’m thinking about conflict, and what it says about the things that need to change in me. When I was a kid I was terrible at waiting for things. My sister, Jody, and I would always tell each other what we were getting for Christmas. I just had to know, even though it pretty much ruined Christmas morning as a time of pleasant surprises. Driven by my appetites I was terribly impatient as a young person and typically wanted things now. Perhaps this developed from being the youngest sibling and watching others get to do things first while I had to wait until I was big enough or old enough. Perhaps it’s just part of my personality. Whatever the case, I can tell you that throughout my life journey when I was given a choice between the instant, easy gratification of a known quantity or the long, slow, patient wait for a promised, better pay-off down the line, I have typically always chosen the former. I’ve been very good at taking the easy-way out. This trait has generally not served me well. So it was with great interest that I read the story of the Hebrew tribes of Reuben, Gad in today’s chapter. If you’ve been following the larger story we know that many years before today’s chapter Moses led the Israelites out of slavery in Egypt to the Promised Land God had promised them in the land of Canaan. Back in those ancient days the land was largely made up of small city-states that controlled a small territory. Sometimes these towns would band together to form a larger, regional power in the area, but often each city-state would build a wall around their village and go it on their own. In those days it was a dog-eat-dog world in which people groups were constantly invading and conquering one another. You were always at risk of a larger, stronger people showing up out of nowhere, conquering you, killing your entire population, and taking all of your possessions as plunder. If the Israelites wanted the Promised Land they would have to take it by conquest. It seems bloody and barbaric in our politically correct, modern Western world, but the ancient world of the near east was a bloody, barbaric place. It’s just the way it was. A generation earlier, on their first visit to the Promised Land, Moses sent spies into the land to check things out. All but two of the spies were fearful and advised not starting a military campaign to take the land. Two spies, Joshua and Caleb, advised that the Israelites have faith in God and go for it. Because of the tribes’ lack of faith God said they’d continue to be a nomadic, wandering people for an entire generation before giving their children another chance. Will the Reubenites and Gadites really be committed to supporting the conquest when their wives and children are back on the other side of the Jordan? Will the Reubenites and Gadites leave their best fighters to protect their families and possessions and send their worst fighters on conquest? How’s that going to go over with the other tribes? Once the Promise Land is secured will the Reubenites and Gadites be pissed off when they realize that they settled for less when they could have had much better land if they’d just been patient and held-out like the other tribes? All of the hard lessons this impatient person has learned along my life journey tells me this is not going to end well. This morning I’m reminded of some of my own mistakes when I chose immediate, easy gratification over a much better, promised pay-off that required patience, fortitude and/or hard work. Some of these mistakes were silly and insignificant, but others were tragically life changing. I’ve learned over time to recognize the pattern in myself. I’ve developed more patience. Having experienced some really good “promised land” rewards and delayed gratification has given me positive reinforcement on which to draw upon. I’m more likely to make wise choices today than I was in my younger years. Nevertheless, I’ve learned that some natural inclinations never go away. I just have to learn to recognize and manage the moment when I’m tempted to take the easy way out. David was thirty years old when he became king, and he reigned forty years. When I was a boy I spent entire class periods of elementary school learning how to use the library. If I was interested in a subject or had a question that needed answering I would have to wait until the day of the week our class would visit the school library. 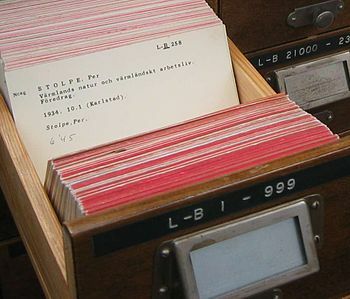 I would look up the subject in a large set of drawers that housed small index cards arranged by the Dewey Decimal System. It gave me a number that corresponded to the numbers on the spines of books arranged on the shelf and from there I could find all the books on the subject that interested me. Then, all I had to do was scour the books on the shelf to find what I was looking for. By the time I was a teenager there was a set of Funk & Wagnalls encyclopedias on the book shelf in our home. My mom acquired the entire set of encyclopedias, volume by volume, over a period of time using S&H “Green Stamps” she got at the Hy-Vee grocery store. What a time saver. Now, if I wanted the answer to a question I could go to our basement family room and look it up in the encyclopedia. When I was in my twenties I purchased my first computer. It was an IBM PS1 with a 3.5 inch “floppy” disc drive and no internal hard drive. I eventually purchased a 300 megabyte hard drive for just over $300 and installed it myself. With that computer I got on the internet for the first time through a phone line that dialed-up the connection, but anyone trying to call me at home would get an intermittent tone called a “busy signal” telling them that I was using the phone line at the moment. By the time I was thirty, I was able to access almost any information I wanted on the internet from home. No going to the library. No looking it up in a book. Simply dial-in to the internet (which by then I could do AND still use the home phone line AT THE SAME TIME! Genius!) and type in what you’re looking for. On the way to the lake this past Wednesday night Wendy and I saw a gorgeous rainbow. “Why are rainbows arched?” we mused. Wendy simply picked up her phone, which is connected to the internet at all times, and asked the question. Everything you could possibly want to know about the subject was available to us instantly on our cell phone as we sat in our car speeding down Highway 63 in rural Missouri. Face it. We are becoming an increasingly impatient people. I think we have enjoyed the blessings of rapidly advancing and evolving technology which deliver results and instant gratification, but scarcely have we realized the impact that it’s having on us. David was anointed king as a boy. Chapter-by-chapter we’ve followed his journey across some twenty years from being a young hero over Goliath, to developing into a warrior, to spending years as an outlaw on the run, to becoming a mercenary for hire against his own people, to becoming the leader of his tribe. He didn’t realize the fruition of his anointing until he was 30. Some things take time, and we are being increasingly conditioned to believe that everything should happen for us immediately and upon demand. I know I’m at risk for sounding like a stodgy old man grieving the good old days, but I’m really not. I enjoy the blessings of technology as much as everyone else. At the same time, I wonder what it is doing to me, how it is changing me, and when I should be concerned. One of the fruits of God’s Spirit is patience. David had to learn it in his long trek to the throne. I have had to learn it (often the hard way) in relationships and life and art and business. Today, I’m reminding myself to be patient. Some things take time in order to work out for the best, and I want God’s best for me, no matter how long it takes. The Only Author To Have A Unique Dewey Decimal Number Devoted To Them Is? When I was a young man, I couldn’t wait to grow up. There is a natural progression of time and life, but there was something in me that wanted desperately to push everything forward. My restless, extroverted nature was always pushing the clock. I wanted to got. I wanted to move. I wanted to push things forward. Perhaps this was the result of being the youngest or perhaps there was a spiritual restlessness in me. In any event, I was always pushing the timeline to get to adulthood as quickly as possible. I graduated from high school early. I went to college early. I got married early, and I had chidren early. Looking back on my life journey (from just over the hill), I can see the natural consequences and difficult life lessons that resulted in me trying to constantly push time and circumstances to acheive my own personal will and desires. As I’ve progressed in my journey I’ve come to a deep appreciation of God’s divine timing. I have increasingly learned the contentment required to wait for to be at peace in the moment and to wait for God to move. In the story of David and Saul we see another stark contrast between the two men in this regard. David was anointed king as a child, but has patiently refused to push God’s hand by taking Saul’s life and stepping up the timeline to his ascension as monarch. I’m sure it couldn’t have been easy, especially since it resulted in years of being an outlaw and living in exile. Saul, however, was always pushing his own will. It was what got him into hot water in the first place and in today’s chapter we see that he has still not learned the lesson. His decision to consult a medium and conjure up Samuel’s spirit is just another illustration of Saul’s refusal to be content with God’s will and timing. Today, I’m taking stock of the circumstances of my life in which I feel impatience. There are a number of them. Naming them one by one, I am choosing to let go of my will and timing. Instead, I am handing them over once more to God and entrusting them to His perfect will and divine schedule. I am sick at heart. How long, O Lord, until you restore me? How long until I’m old enough? How long until I get married? How long until I’m better? How long until I’m pregnant? How long until this is over? How long until I’m over this? How long until you show me the way? How long do I have to endure this? How long until I find a job? How long until things are reconciled between us? How long until this house sells? How long will I feel this way? How long until we’re out from under this crushing debt? How long until the kids are out of this phase? The songwriters of the Psalms commonly use the repeated phrase “How long, O Lord, How long?” in their lyrics. As we journey through each song, you’ll notice it cropping up again and again. Waiting, persevering, and enduring are common and critical to our human experience and to our spiritual maturity. I love that King David and the other lyricists were not afraid to wrestle with and express some of the most powerful emotions we face on our own journeys. Today, I’m looking back at long stretches of my journey through which I had to press on and patiently (or impatiently) endure. I’m considering the abundant ways those agonizing waits helped me to grow and mature – how they prepared me for the rest of my journey.